For the last few years, I've been searching for a replacement for P.E.E. 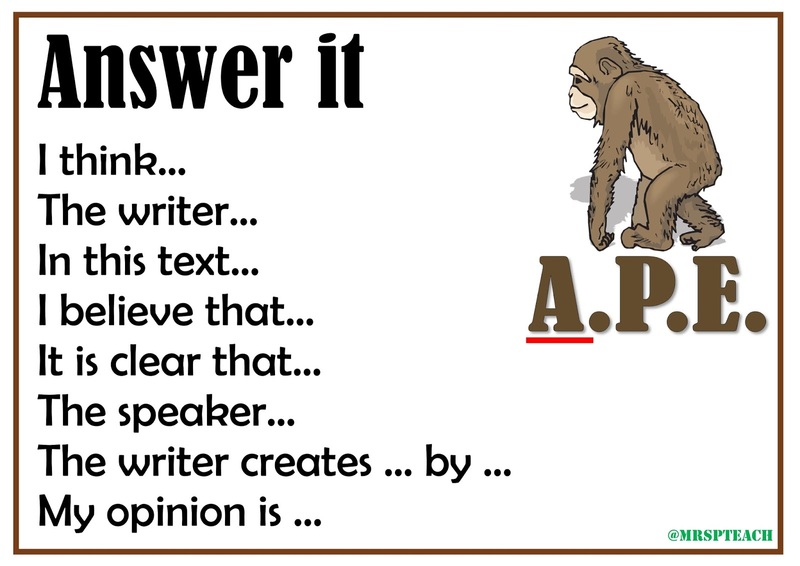 to help children answer longer response questions in reading. I think it's a little silly to have an acronym for children which has two letters the same; it makes it harder to remember the letters. Last year, I played around with using What? How? Why? as a format but, again, children forgot what each section meant they had to do. Not satisfied, I continued searching for a solution. 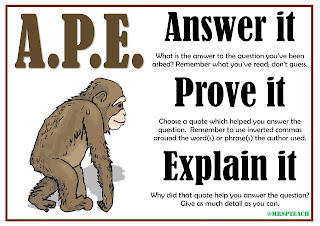 Recently, I found a post-it note on which I had scribbled down 'Answer it, Prove it, Explain it'. It turns out, on Googling, that this isn't a new concept so I thought it was definitely worth a try. Having made some posters hopefully making it clear to children, this is what I'll be trying this year. 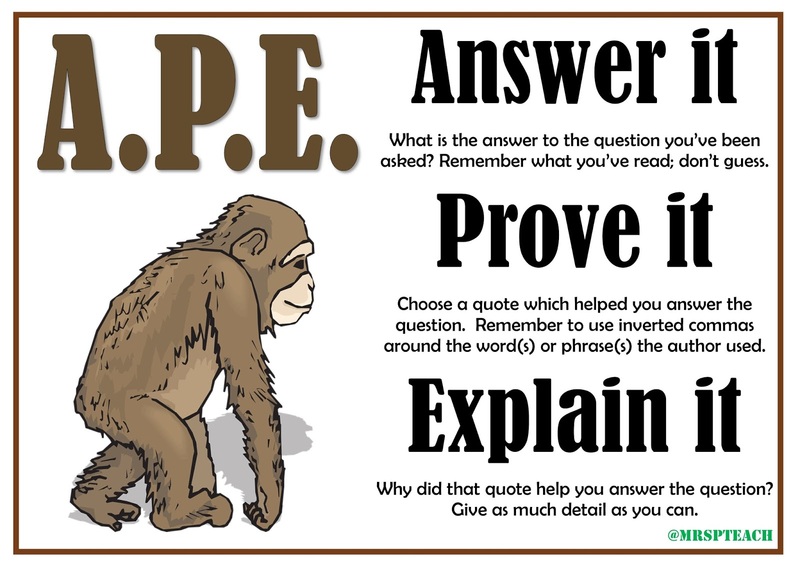 The idea is that all children in KS2 should be taught to answer questions with reference to the text (Answer it and Prove it) as per the National Curriculum. As they get older and more mature, including an explanation of links with other parts of the text and prior knowledge becomes important. 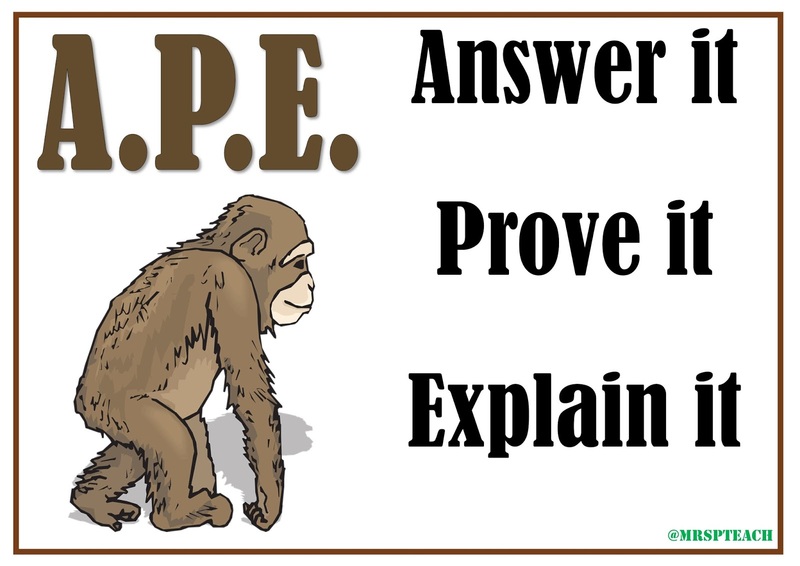 Below you can find a poster explaining A.P.E. and some posters with sentence starters. 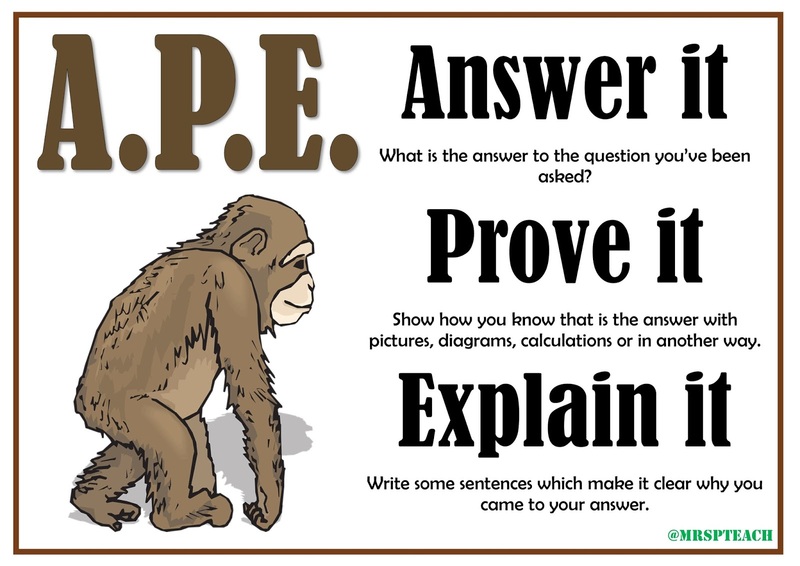 I'll be printing off the main poster for my cupboard door and printing some small versions of the sentence starters to go on tables during lessons. Feel free to download and use the posters which are available in JPEG and PDF format in this folder (or click the RIC Resources link in the side bar). 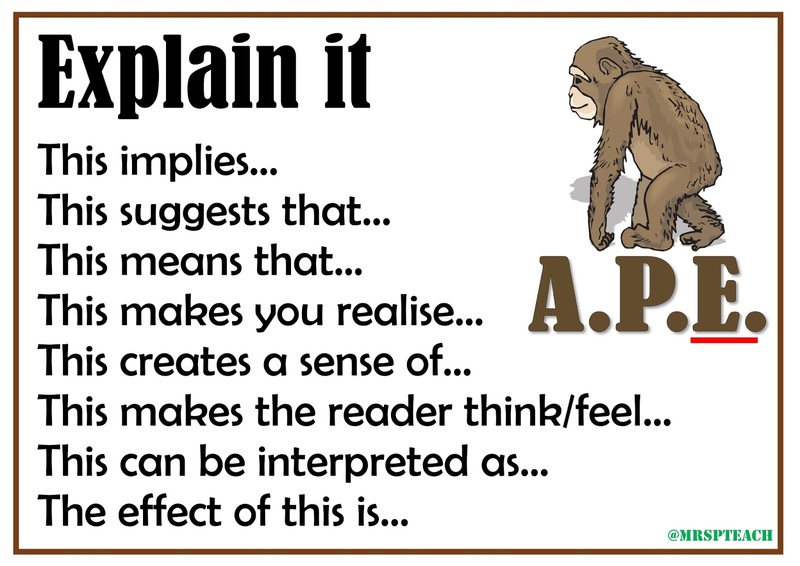 Through Twitter, I have heard that many people have started "Going APE" in their reading lessons, throughout KS2 and KS3. 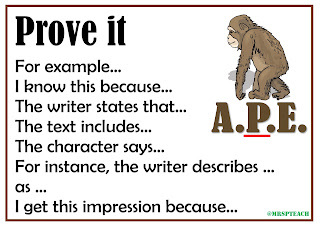 Many have used APE for interpret (deduction/inference) questions including alongside Read with RIC lesson starters. 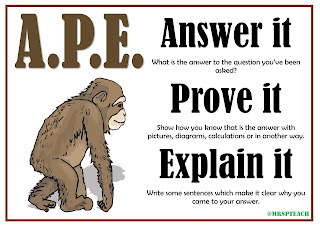 Alison used APE in maths to help children answer true/false or yes/no questions. 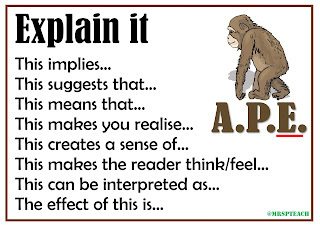 This inspired me to create an APE poster which could be used in maths and a blank one which could be used for any subject or adapted. 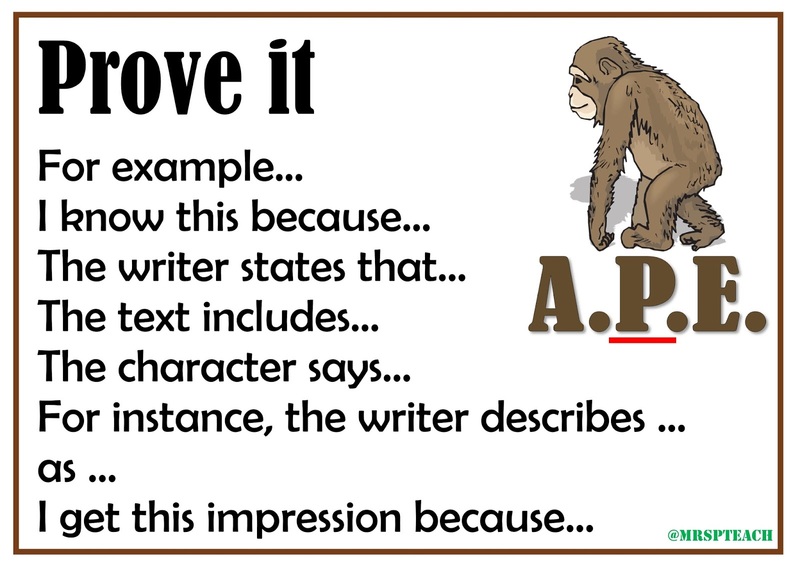 PLEASE NOTE: This post was originally published with the image of a monkey on the posters. 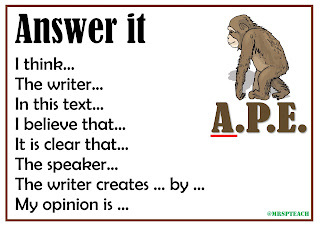 This was due to me struggling to find a cartoon APE with the appropriate copyright terms. Just what I have been thinking about too...Thank you. Can someone come up with a KS1 version? I so need to revamp my reading/guided reading!! Thank you, I really like these. This is a better reminder. I'm just about to use it in maths reasoning. Interesting! I'm more familiar with RACE (restate, answer, cite, explain) and PIE (persuade, inform, entertain). Well, those and the basic but dull PQA (put the question in the answer). How do people adapt guided reading for KS1? We are trying to change to way we do reading lessons but looking for any good ideas that keeps children on task. 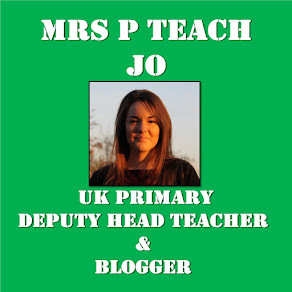 I currently teach year 1/2 so any ideas welcomed. 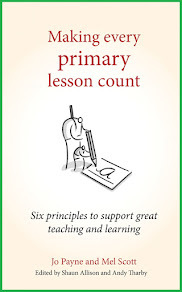 Brilliant - I really like these - I was wondering how I could focus on the reading in maths - this is it. Thank you. A more effective tool than PEE. I hope this won't be too out of place here, but I really think your APE is going to pee all over my old approach. Thank you!